We start with an amazing cinnamon walnut coffee cake that was chosen for Oprah's "O-List". The 8" cake is made with farm-fresh eggs, pure bourbon vanilla, sour cream, and crunchy walnuts, with a cinnamon streusel added to the center and the top of the cake. In addition to the cake, the tower includes some of our favorite confections including English Butter Toffee, Chocolate Sea Salt Caramels and Peppermint Bark. 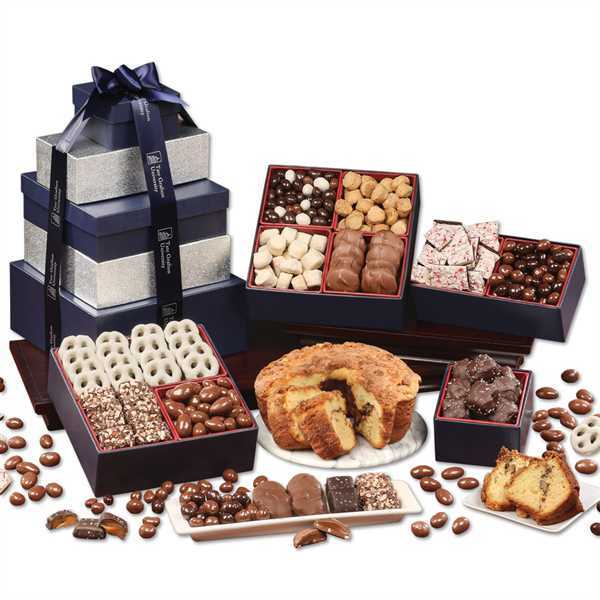 All this incredible goodness is packaged in our elegant navy and silver tower. Your logo is foil-stamped in silver on the navy satin ribbon. Here's a gift that will make them stand up and cheer! Serves 24-30. Tower measures 8.5" x 8.5" x 12.5". Price Includes:imprint foil-stamped in silver on navy ribbon.